Photo courtesy of Island Photo. The commitment to a life-long union is a very special one, and we are happy that you are thinking of making Trinity Episcopal Church part of your wedding, blessing or renewal of vow ceremony. We hope this information will answer the most common questions you may have. Trinity Episcopal Church on Mackinac Island is a living church with an active year-round congregation. The members of Trinity extend their beautiful church home for weddings, blessings and renewal of vows as part of our outreach. The Nineteenth Century historic buildings are part of the fabric of Mackinac Island erected for Christian worship. It is in this spirit that we hope you approach your ceremony. The donations derived from these ceremonies are used to further the church's work and to preserve these historic buildings. Who may be married, blessed or have vows renewed at Trinity? It is not necessary to be a member of Trinity's congregation or to be an Episcopalian to be married, have a blessing or renew vows. Nevertheless, a ceremony at Trinity is different from one that takes place at City Hall or another location. We hope that couples who come to the church seeking God's blessing of their relationship will be open to a discussion of the spiritual nature of that relationship and the place of God in their lives. The Episcopal Church requires that at least one of the people be a baptized Christian. In addition to traditional weddings and renewal of vows, Trinity Episcopal Church welcomes same gender couples for a blessing of their relationship. Trinity does not have clergy on staff, but we do have a contact list of Episcopal clergy. 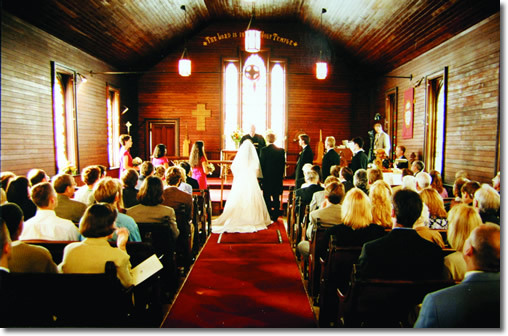 It is the responsibility of the couple to obtain clergy to perform the ceremony. We believe that marriage and blessings should be given thoughtful reflection. Your clergy will explain the requirements of the church and/or denomination regarding Christian marriage. With this in mind, Trinity requires that all couples wanting to be married or blessed receive counseling from clergy. Please send documentation of completed counseling to Trinity's vestry at least one month prior to the ceremony. In the event that the officiating clergy and the counseling clergy are different, the counseling clergy must submit written verification. Visiting Episcopal clergy may officiate or assist at a wedding or blessing with the consent of the Bishop of Northern Michigan: The Right Reverend Rayford Ray at (800)236.0087. When can a wedding, blessing or renewal of vows be scheduled? Trinity is open all year. These ceremonies are most often scheduled on Saturdays, although other days are available. The date needs to be mutually agreed upon by the couple and the vestry of Trinity. A letter of application must be submitted to the vestry at Trinity Episcopal Church, P.O. Box 472, Mackinac Island, Mi., 49757 or via email to trinitymackinac@gmail.com. The following information should be included: requested date and time, officiating clergy and denomination, and a signed copy of this policy. If emailing, the signed policy should be sent as a printable jpeg or PDF. What order of service and text are used? For Episcopal weddings, the service is available in the Book of Common Prayer. For other denominations, appropriate service texts may be selected by the clergy and the couple. For blessings, a Liturgy of Blessing for Same-Gender couples was developed by the Standing Commission on Liturgy and Music of the Episcopal Church. These materials were approved for use by the 77th Convention of the Episcopal Church, July 2012. They have been edited for use in the Diocese of Northern Michigan by the Diocesan Liturgy Committee. For weddings, the couple must obtain a marriage license from the State of Michigan. This may be obtained at the Mackinac County offices in St. Ignace, Mi. (906)643.7300. If the couple lives in Michigan, it should be obtained at the county office where they reside. 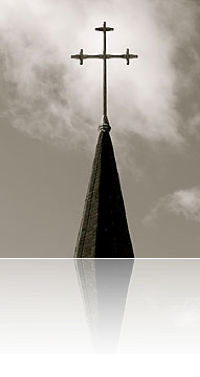 Music should reflect the tradition of the church as a whole. Hymns, sacred and classical music are appropriate. An organ and a piano, in the church sanctuary, are available at no extra charge. If you have other ideas or additional musical instruments, or wish to use the organ, please contact us. What flowers can be used? Brass vases are available for floral arrangements on the altar. Additional flowers may be placed elsewhere in the church. At the discretion of the couple, flowers may be left for the Trinity congregation. Otherwise, flowers must be removed within one hour of the service. In addition, there are altar candelabra and free standing candelabra available. For safety reasons, pew arrangements that contain candles are not permitted. Candles placed elsewhere in the church must be enclosed. After the ceremony, no rice, confetti, birdseed, balloons, or bubbles can be released or thrown into the air. How do we schedule the rehearsal? The rehearsal time is scheduled with the presiding clergy. The restroom is located in the parish hall next to the church. 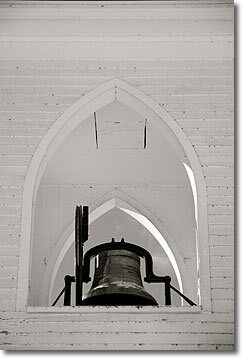 Photography inside the church building must respect and honor the reverence of the ceremony. Flash photography is prohibited during the service. Please refrain from using or placing any still or video equipment anywhere around the altar. Professional video equipment and still photography are allowed with the stipulation that they are operated from the back of the church. Before or after the ceremony, photographs maybe taken inside the church. Can we use the parish hall? The parish hall is available two hours prior to the ceremony for dressing and photography. Please assign someone from your party to clear out the parish hall, no later than one hour after the ceremony. Trinity is not responsible for items lost, stolen, or left in the church or parish hall. The parish hall is available for a reception, however, no alcohol is permitted and it is a smoke free facility. One thousand dollars, $1000.00, is the required donation for the use of Trinity Church for a wedding or a blessing. Three hundred, $300.00 is the required donation for the use of Trinity Church for a renewal of vows. Five hundred dollars, $500.00 is the required donation for the use of the parish hall for a reception. A deposit of 50% of the full donation is required to confirm a date. The balance of the donation is due one month prior to the ceremony. The couple is responsible for negotiating the fee with the officiating clergy. Trinity is a lovely historic church and does not need a lot of decoration. Decorations must be fire retardant and should be kept to a minimum. Furniture, fixtures, and the piano may not be moved. In addition, the use of nails, screws, tape, and the like are prohibited. There are two electrical outlets in the church for equipment, but there are no extension cords available. The church is not air-conditioned, however there are two ceiling fans. Thank you for considering Trinity Episcopal Church for your wedding, blessing or renewal of vows. To request a date, please sign below. We have read, understand and agree to abide by the policy of Trinity Episcopal Church as stated above. Please return this entire document with your signatures. Download a PDF version of the Policy for Weddings, Blessings and the Renewal of Vows.